The newly created Forslund Dix Point Nature Preserve, on the northwestern tip of Drummond Island, includes more than 56 acres of land and 1,800 feet of St. Mary’s Channel shoreline. “Our grandfather, Carl Forslund, Sr., first came to Drummond in 1947 to hunt and loved it so much that he bought a small cabin on the Old Ferry Dock Road from Chuck Zeerip, sight unseen. My siblings, cousins and I all grew up spending our vacations in that one-room cabin without running water, and my cousins, who own it now, did the same with their children who are now doing it with their children. There have been five generations staying in that cabin, still without running water. I can’t remember the first time I came to Drummond; it has always been a part of my life. Little Traverse Conservancy has been expanding its holdings in the Eastern Upper Peninsula, with a particular focus on preserving pristine shorelines. The Curtis Anderson Preserve is located on the south end of Dix Point Road. 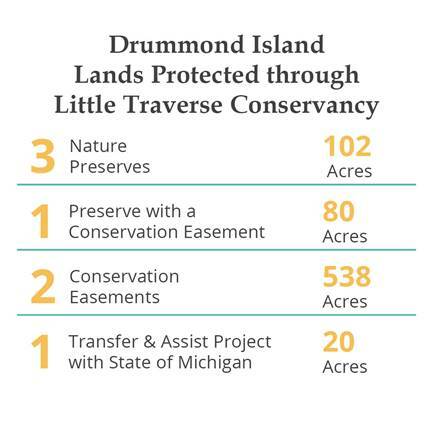 Other LTC preserves on Drummond Island include the Williams Preserve by Tourist Road. This preserve includes a parking area and a trail. For more information about this and other LTC preserves near you, use the online interactive map, or stop by the conservancy’s office for a free copy of the nature preserve map.